A Creative Collaboration, among friends & colleagues. What an honor for our very own “She Who Sews” fabric collection to be the featured fabric for this Sewing Room Blog Hop. If this is your first visit to the Joy Studio, please have a look around and tell us what you like to create, especially using your She Who Sews fabric. To learn about the creation of Handmaids™ and the art process in the beginning stages, I invite you to join (like) us on the Handmaids Facebook page or click the like button to the right in side bar. 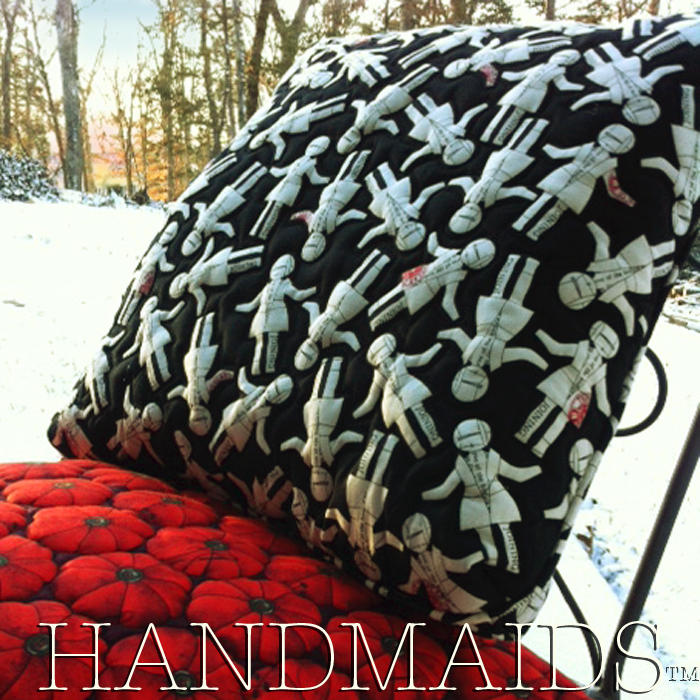 Also visit Handmaids.com where you can sign up for our newsletter and receive regular product updates. And please, be sure to get in on our GIVEAWAYS! One is here on the Joy Studio blog, simply comment to enter and one on Facebook’s HANDMAIDSGreatJoyStudios, for a like and comment telling us so, you will be entered. 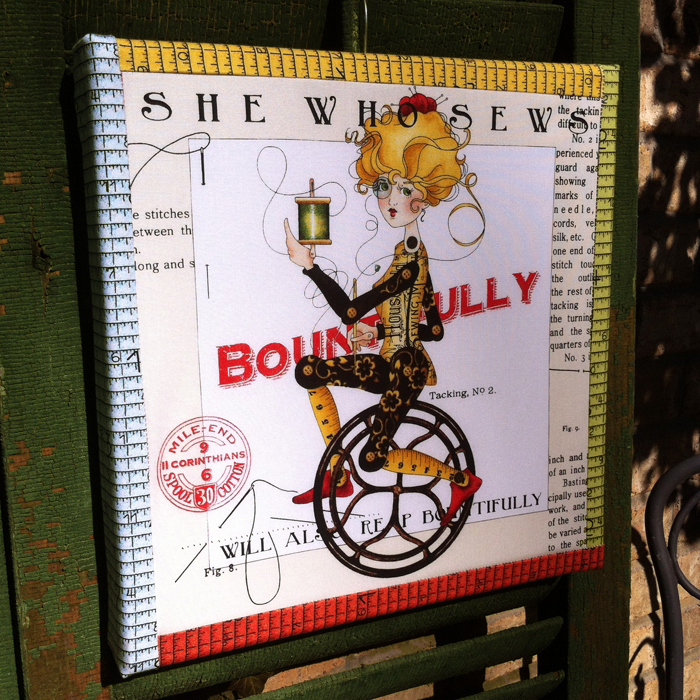 Both offers are for a She Who Sews fabric fat quarter bundle and a canvas wrap, wall art piece. If you already like Handmaids™ on FB, just a comment will work. Winners will be announced on FB February 7th. I was certainly privileged to collaborate with four friends on our contribution to the She Who Sews Blog Hop. 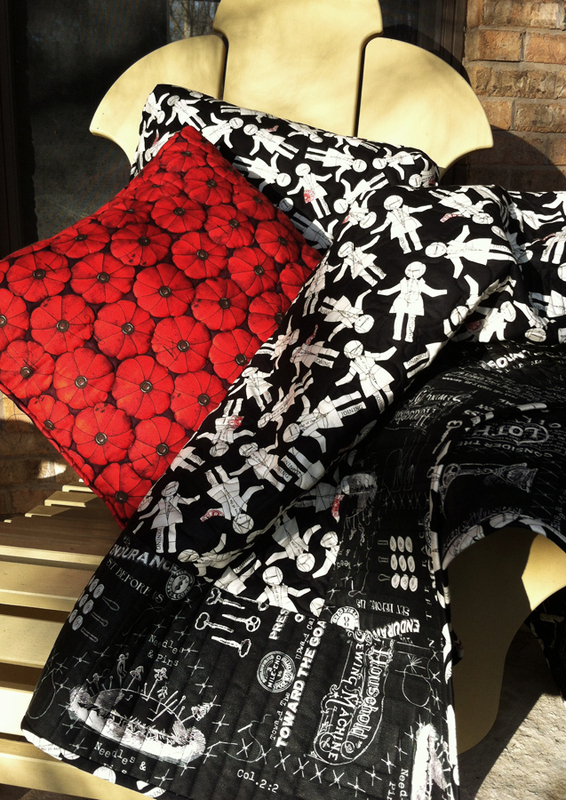 Together we designed and created several items, pincushion & paperdoll pillows for the comfy couch in our Joy Studio and others to wear. Allow me to introduce these skilled sewers and quilters, through their beautiful projects listed below. It has been a privilege and pleasure, to see our very first collection in the Handmaids™ series, She Who Sews, featured in the Sewing Room Blog Hop. Thank you Carla & all of the Blog Cheerleaders for inviting and supporting me. And a sincere thanks, to all of you, for stopping in. Please don’t forget to leave us a comment (to be entered in our giveaway). I would truly enjoy hearing from you. THANKS everyone! And a HAPPY BIRTHDAY to my sister, Barbara! These designs are great! I really like the positive message, the minute details and the oh so original concept! I can’t wait to get my hands on some of this fabric! It is so cute. How cute those two are all dressed up! off to hop! There’s only one problem with your fabric lines: once I get my paws on them, I don’t want to cut them up and use them! Look forward to seeing these cuties in person. 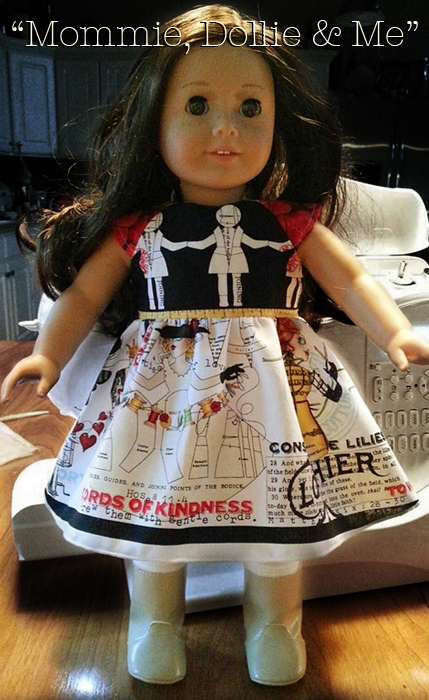 Love the little girl’s dress and doll, and the purse would definitely tell the world what I love to do. Janet, these are all wonderful. 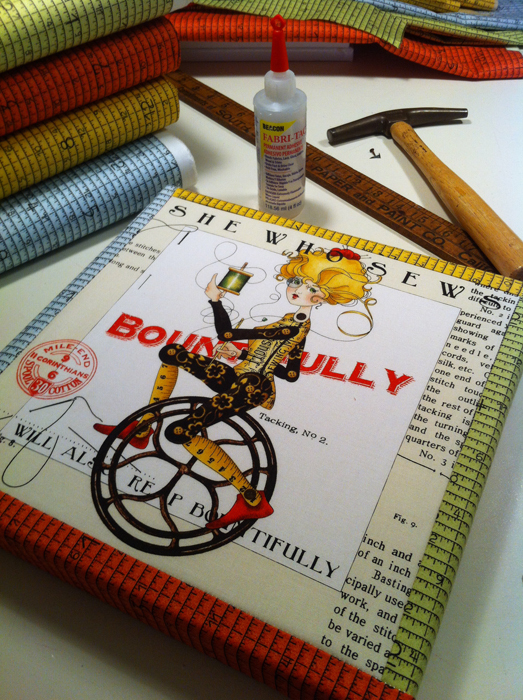 I must wrap a canvas for my sewing room (studio). When does a sewing room become a studio. It sounds so much better that way. I love your fabric designs and will enjoy a room- studio decorated with this fabric for a long time. Great projects! Love the large panel print, sew much you can do with it. All very cute! I love the wrapped canvas idea. What a easy way to decorate a sewing room! I am in this hop and plan to show off my creation in a couple of days. Love your fabric!! I just got a sewing room & hope to get your fabric to decorate with! Love this ..I have the panel but haven’t found the rest. Oh, I love your design. And I am working your fabric for the moment, started late yesterday evening , my day to post is next Monday, and this blog hop gives me loads of inspirations. And my sewing room needs styling. What wonderful projects. The pillows look great, but it is those dresses that take my breath away. How stunning! I love this fabric line – actually went to several quilt shops and online to purchase it. It was like a treasure hunt – but so worth it. I love the design and the quotes on the fabric! Will be redoing my sewing room to incorporate these fabrics! Great job! I fell in love with this fabric ! Every thing you all made is an inspiration. I definitely liked you on Facebook as well ! Your fabric is truly special and I love the way it was used in the projects you shared with us. You ladies have designed some fabulous pretties with this awesome fabric! But I have to say, that mommy and me ensemble steals the show! That is FAB! I am headed over to FB to LIKE your page. I am interested to see what is up next on the agenda! Your fabric is so beautiful, I love the designs! Fantastic projects!! You put a lot of work in this hop and they are gorgeous! Wow, lots of goodies to look at. Love those dresses. Very clever. And the pillows are perfect! I love the pillows, the quilt, the dresses, the bag, the wall art–it’s all lovely–and I like this fabric line very much. I hope I find more at a quilt shop here, or I will order more. Must make some covered canvas art. Thanks for your inspiration! WOW!! You all went wild. 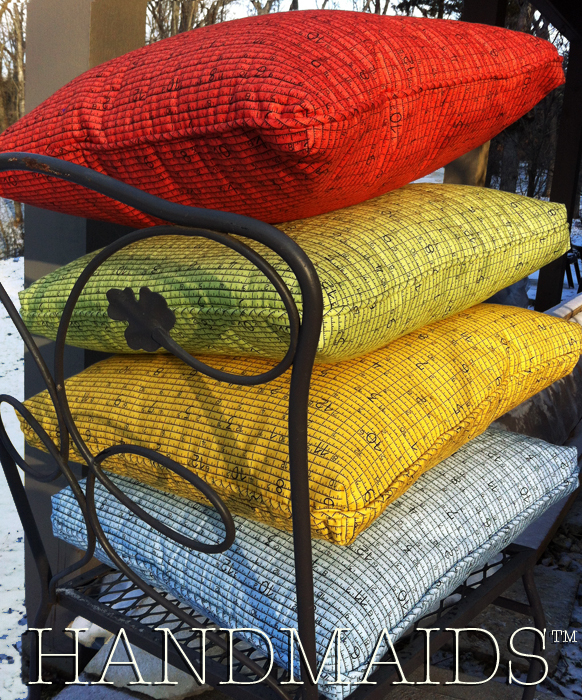 What awesome projects showcasing this amazing fabric line. And a great way to begin the hop! Love the graphic panel and the solids to go with it. I can see pincushions for my quilting buddies as Christmas gifts. What great projects! 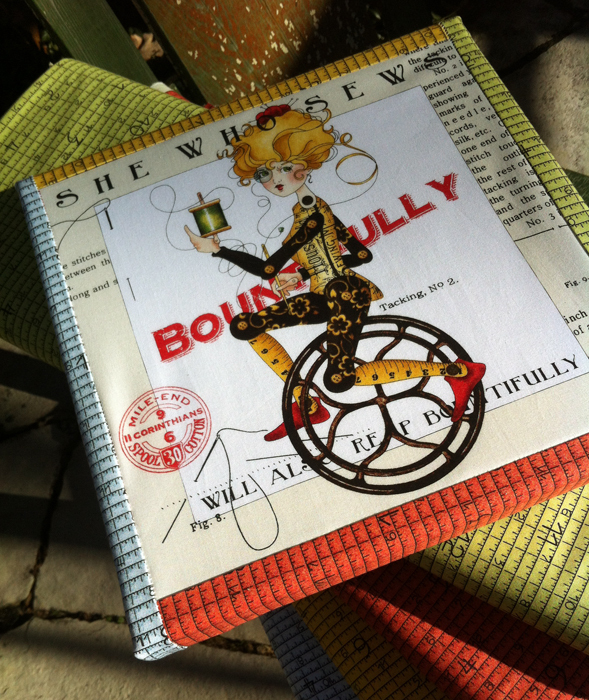 I especially love the paperdoll pillow. The trapunto effect is perfect for it! Beautiful designs! Very nice fabric line. I haven’t seen it before. What a lovely fabric collection – love the bag! Wow, so many cool projects! Oh how I would LOVE to win some of this fabric! I waited for months for it to come out and have only found ‘some’ of it. Never can get too much! I will certainly be checking my LQS for this fabulous fabric. Thank you. 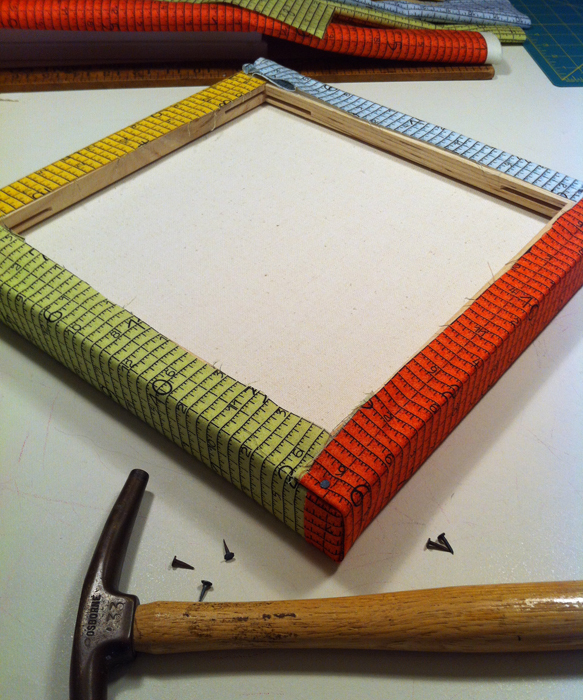 Love the canvas idea- now have to get to my lqs for some fabric! 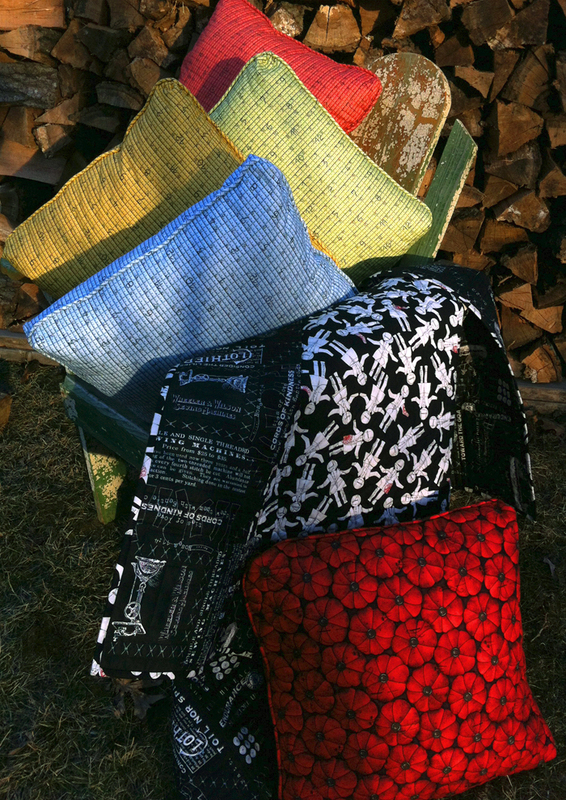 Beautiful designs and projects…love the fabrics! LOve working with your fabrics. Such pretty color and design choices. And great idea for the canvas wraps. Darling fabric and colors. The pillows would be perfect for my renovated home-thanks for the ideas! Love your fabric. What inspired you? Very, very different. And love the purse, the pillows the dresses. I would love to create with your inspiring fabric. I love the fresh crispness of your fabrics. Brilliant, fantastic, fabulous fabrics! 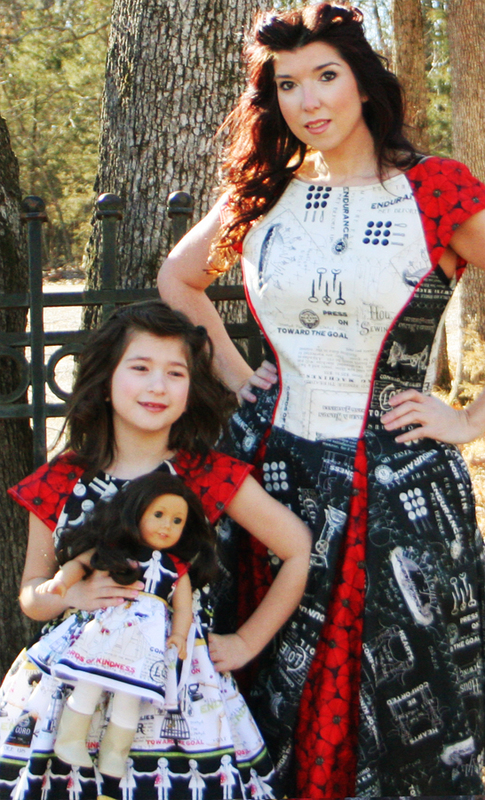 The Mommy, Daughter & dolly dress are to die for. I have a steampunk daughter and am really going to need to get my hands on some of this. I have never seen it before and am about to search some out! Thank you for the hop and giveaway. Gorgeous fabrics. Such delicious colors! What a beautiful & fun collection! Loving every bit of it – need some for my stash. It will be hard to cut into it but I’ll manage. I am lovin’ this line. BUT am having a hard time locating it in the stores. Oh! I love that fabric! Not seen it in the shops yet but will be looking for it now. Fun fabric to work with. Thanks, I have enjoyed sewing with it 🙂 Your projects are great, love the pillows! I really like all your projects, but the dresses and the pouch is so adorable.Thank you for the chance to win the fabrics. (I have also liked you on FB. These projects are wonderful! I especially like the canvas wall art. wow i really enjoyed looking at the fabric i think a tote would be very cool…..
what a very creative use of you wonderful line of fabric!! I really love the quilted doll pillow and wish I could have found that particular fabric as that was neat!! I can’t remember the last time I was so excited over a line of fabrics. I love the idea of a canvas with them in my sewing room! I do hope we see more of this delicious fabric in our quilt shops soon! Love,love,love this fabric! Can’t wait to get my hands on some! The fabric is fun – can see using it for some interesting projects! 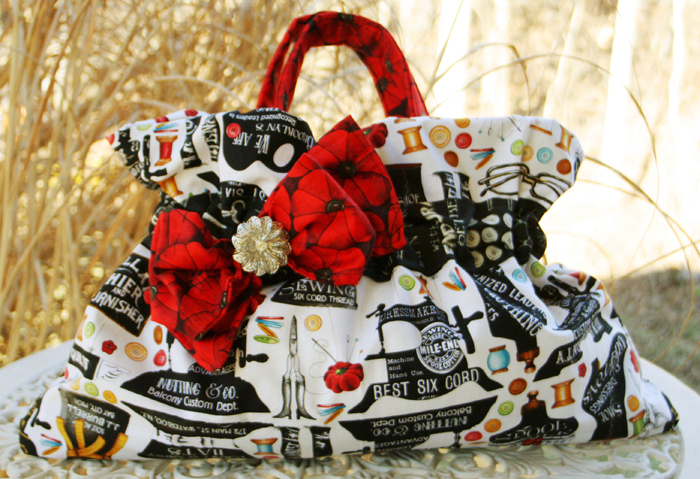 What pretty projects…love that little purse!!! Love. The canvas wrap. I NEED for my seeing room! New to quilting could so use this! I just love this fabric!! Plus all of the projects made from it is incredible! I just love the little girl outfit with the matching doll one too. My last name is Frisch too (my married name) – I wonder if my hubby’s family is related to you somehow??? Oooohhhhh…..I love the fabric! You all are awesome! What a wonderful showcase of projects! 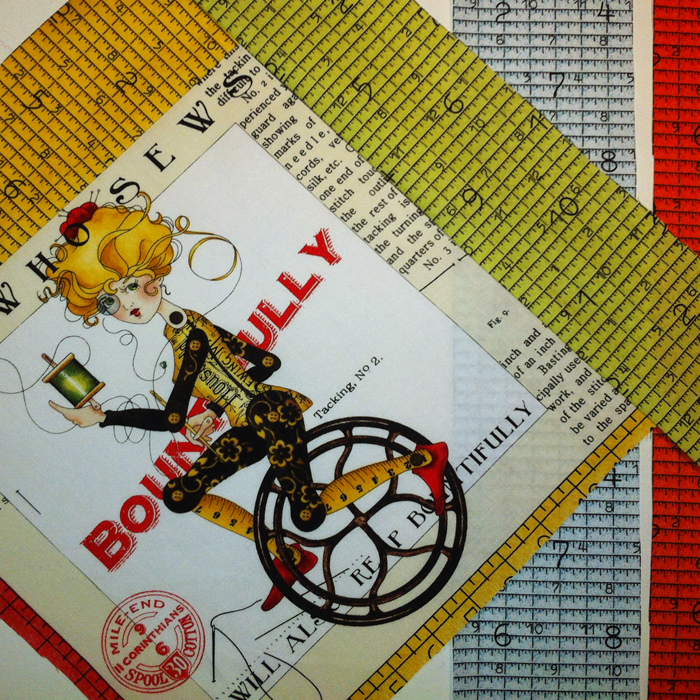 ♥ these adorable Gibson-Girl Steam-Punk Scripture-referenced prints. Sweet picture with Mom, the little girl and her matching dolly. Love the canvas wrap idea. Great fabric collection! Great fabric and projects! Thanks for the chance to win. Really neat projects. Photos are great too. I am totally in love with the child’s dress and the bag. I am going to order some fabric asap, it’s just too cute to pass up. Don’t have a quilt shop near me so would love to win a fat quarter bundle of this wonderful fabric! Oh this ideas your blog has inspired…need more sew time. Wonderful fabrics wonderful projects you’ ve made! Beautiful fabrics and I have made several projects with them! I like you on FB also. I love the dress, great creations and great fabric. You have created a fantastic fabric line. I am hoping that I will be able to get some to make a wall hanging for our new house and hopefully more. What a perfectly JOYful fabric collection and blog hop. I like everyone of the pieces in the collection. It’s going to be such fun watching for all the creations the presenters have made. I love that pincushion fabric; looks like they could jump right off the fabric. I don’t do Facebook but I’m off to sign up for your newsletter. The fabrics are true ART! Wonderful fabrics and such fun projects. Your fabrics are sew beautiful! I love them!! Lovely dresses, I just love these fabrics. I LOVE this collection! I can’t wait to see more from you! From looking at the others ideas, there are many others who feel the same way! Congratulations on beautiful fabric! I love this collection! These would be sew cute in my sewing room. Thanks for sharing the way you made the wall art. I’ve liked your Facebook page and look forward to seeing more of your work. Such fun fabrics with luscious colors!! Great projects and thanks for the chance to win your giveaway. I just love, love, love your fabric line…,and just find it delightful. And the creations you have come up with are fabulous…but I must say the matching dolly and little girl outfit are my favorites. Thanks for creating such a whimsical group of fabrics! Love the fabric… especially the red and black piece. Do you sell this? Ideas are running around in my head!! Love the purse! Love your fabrics! Wow! You’ve been a sewing machine! Love your projects. I think I need a canvas for my room too! I love these fabrics. Thank-you for the projects. I can’t wait to try them. Oooh, love those puffy pillows. I love your fabric line. Liked your Facebook page and now follow your blog. What a delightful collection of fabrics. I was thrilled to find these at Chattanooga Quilts before Christmas and enjoyed using some of the prints in Christmas presents for sewing ladies I know and love! Thanks for the additional inspiration. I can now see that there are other pieces that need to find their way into my stash. What great fabric – do you know when it will be available in the UK?? Thank yall for sharing your projects and ideas. What a great fabric line and cute, cute projects! What an inspiring set of projects! 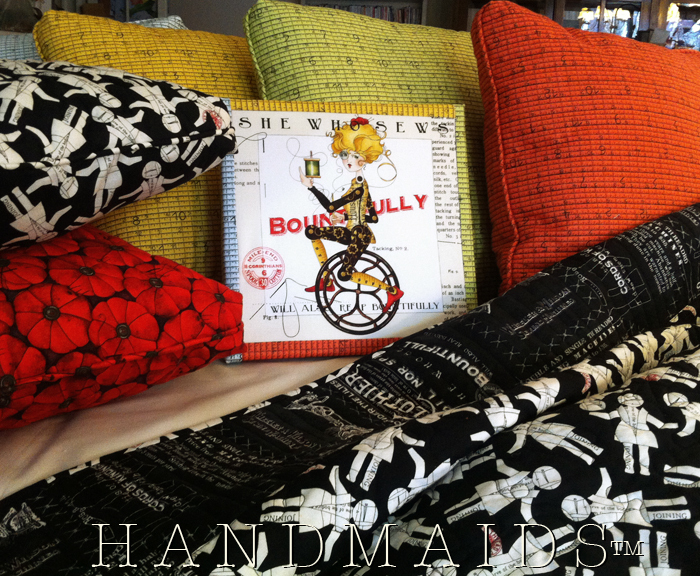 If I had room for pillows in my sewing room, you can bet I would like those to be the first I make! The faces in the feature fabric are delightful! I could look at them forever. And I love the paper dolls too. What fun! What possibilities! Thanks so much for sharing. Thank you for sharing your ideas with the world! I particularly enjoy the florals in this line, and also am looking forward to acquiring some. Have a wonderful day! I just love this collection! Can’t find it in a local quilt shop 😦 It would be great to win the giveaway. What an amazing collection of creations…..each one a joy to look at! I love this fabric and thank you for the opportunity to win! So many lovely ideas! The colours are so stunting and fun to work with! The fabric is so adorable. Love the vintage look. The dresses are so cute. I want the purse and pillows. Need them real bad. Thanks for the giveaway and chance to win. Thanks for a great giveaway. I loved the matching skirts. This fabric is so nice. The illustrations look great! There are soo many things to make with these. I love your new line! I having been buying it up to do my quilt room! Love this fabric, such imagination. It’s going up on my sewing room wall. I love this fabric! You did a great job with designing this! 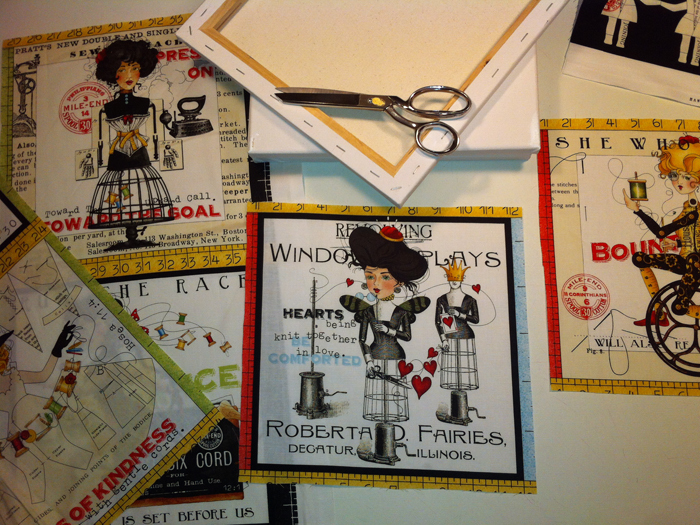 I am following Madame Sams’s Blog Hop and hope to try making some of the creative projects! Great fabrics and project ideas!